Colorado didn't take an especially large contingent to the 2018 running of the Great Southwest Classic, but those who did make the trip were especially effective. 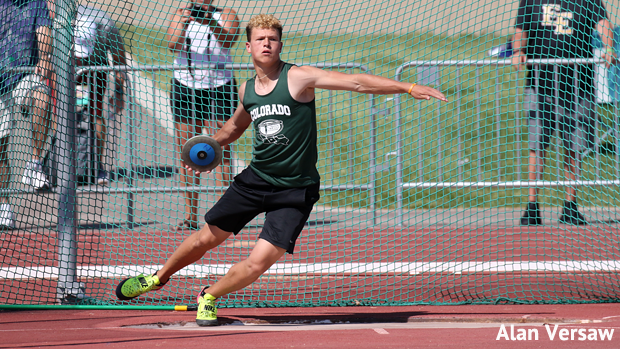 Kain Medrano was one of Colorado's biggest hitters on the weekend, throwing the discus 190-3 to claim one title and the shot put 58-11.75 to win that title a couple hours later. Arguably, those throws set some big expectations for the summer and next year. The shot put, incidentally, saw Colorado claim five to the top eight places--with Reece Davidson, David Hawkins, James Heater, and Mikey Derock each chipping in with big throws of their own. Still talking about field events, Maya Evans went a whopping 20-10.75--and she needed very nearly all of it--to win the long jump. On the track, Emily Sloan chipped in her hurdling talents for wins in the 100 and 300 hurdles at 13.54 and 41.10, respectively. Arria Minor held off a stiff challenge from Sterling Lester out of Georgia to win the 400 in 52.50. In the 4x100s, Colorado's girls hammered the field with a 44.99. The Colorado boys managed third with a 40.04, both believed to be the fastest high school 4x100 ever by a Colorado quartet. Doing the deeds were Maya Evans, Dawnielle Lewis, Sydnee Larkin, and Arria Minor for the girls, and Devin Cadena, Luc Andrada, Tyrese Van Horne, and Zion Gordon for the boys. The girls 4x400 of Mary Gillett, Arria Minor, Taylor James, and Lily Williams was almost equally as devastating in their win. Abby Scott won the open division of the 800 with a 2:15.91. But, it wasn't just event winners who were making the show. Colorado piled up points with 2s, 3s, and 4s as well. Max Manson took a second in the pole vault. He would have needed 18-4 to win, so second stands up nicely. Taylor James got third in the high jump, but her efforts in that event were cut short by a conflicting entry in the 800. James simply shut it down--and understandably so--after the 800, with 5-7 marking the end of her high jump run. Erik Le Roux ran 9:58 as a rising freshman to claim third in the 3200. Colton Stice, Zac Witman, and Le Roux went 2-3-4 in the 1600 earlier in the day. Stice would later add a third in the 800. Larkin's 41-3.25 was good enough for third in a loaded triple jump. All these, and several more, performances added up to a stunning Saturday for Colorado, our best in many years.